The Method Integration Engine is the main synchronization tool that shuttles changes back and forth between QuickBooks and the web server. 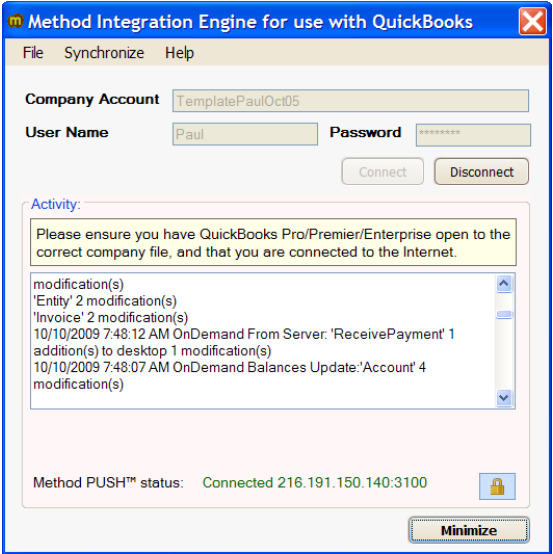 Verify that both Method Integration Engine for use with QuickBooks and QBFC 8.0 are listed. If either is not listed, perform a complete installation again by following the steps for installing the Method Integration Engine. Ensure that Method Integration Engine for use with QuickBooks is listed. Ensure that you are logged into QuickBooks as an administrator if it is a first time synchronization. If you are using Vista, make sure UAC is turned on. Type “UAC” into the search box. Click Turn User Account Control (UAS) On Or Off; choose to turn on. Click Save, then restart your computer. Click Synchronize > Changes-Only Synchronization. When the synchronization completes, check the Activity area and scroll down to see if there are any messages that start with “Error”. If there are error messages, see if there are any recommendations written beside the error, and if so follow the recommendation. If you receive a message that reads “An internal error has occurred…”, it likely points to either an issue with QuickBooks, or corruption in your QuickBooks company file. To check for updates in QuickBooks, click Help > Update QuickBooks. If there are any updates to download you should download and install them, restart your computer, and try to synchronize again. To check for corruption in your QuickBooks company file, click File > Utilities > Rebuild Data. After the process completes, try to synchronize again. Open QuickBooks to the correct company file, then click F2. Highlight the text in the Location text box in the File Information section. 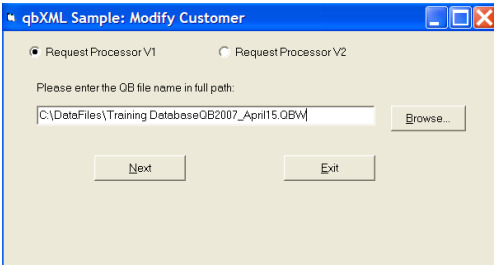 In qbmodifycustomer4, paste the path into the Please enter the QB file name in full path text box, then click Next. Select a customer from the Customer Full Name List. Click Modify > Modify Customer. Make a backup of your QuickBooks company file. Uninstall QuickBooks from Start > Control Panel > Add / Remove Programs. Manually delete the “C:\Program Files\Common Files\Intuit\QuickBooks” folder.